LINDSAY, John Vliet, a Representative from New York; born in New York City November 24, 1921; graduated from the Buckley School in New York City in 1935, St. Paul's School, Concord, N.H., in 1940; Yale University, B.A., in 1944, and from the law school of the same university, LL.B., 1948; joined the United States Navy in May 1943; discharged as a lieutenant in March 1946; was admitted to the bar in 1949 and began the practice of law in New York City; executive assistant to the United States Attorney General from January 1955 to January 1957; delegate to the Republican National Conventions in 1960, 1964, and 1968; elected as a Republican to the Eighty-sixth and to the three succeeding Congresses, and served from January 3, 1959, to December 31, 1965, when he resigned to become mayor of New York City; reelected in November 1969 for the term ending in 1973; changed party affiliation to Democrat in 1971; resumed the practice of law in New York City; unsuccessful candidate for the Democratic nomination to the United States Senate in 1980; died on December 19, 2000, in Hilton Head, S.C.; remains cremated. Oral History: 1967, 22 pages. 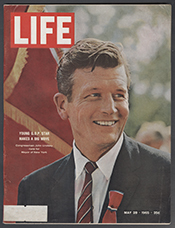 The interview includes reminiscences of John Vliet Lindsay. Papers: In the Howard J. Samuels Papers, 1969-1971, 5 letters. Correspondents include John Vliet Lindsay. A finding aid is available in the repository. Papers: In the Bernard Botein Papers, 1966-1974, 10 linear feet. Subjects include John V. Lindsay. Papers: In the Harry Fleischman Papers, ca. 1930-1990, 21 linear feet. Subjects include John V. Lindsay. Papers: In the Seymour Posner Papers, 1964-1988, 3 linear feet. Subjects include John V. Lindsay. Papers: Press Releases and Statements, 1968-1969, 0.2 cubic foot. Press releases issued by Office of the Mayor about Mayor John Lindsay concerning a variety of issues. Buckley, William F. The Unmaking of a Mayor. New York: Viking Press, . Cannato, Vincent J. "John Lindsay's New York and the Crisis of Liberalism." Ph.D. diss., Columbia University, 1998. Gottehrer, Barry. The Mayor's Man. Garden City, NY: Doubleday, 1975. Klein, Woody. Lindsay's Promise: The Dream That Failed; A Personal Account. New York: Macmillan, 1970. Lindsay, John V. The City. New York: W.W. Norton and Company, 1970. ------. The Edge. New York: W.W. Norton and Company, 1976. ------. Journey Into Politics. New York: Dodd Mead and Co., 1967. ------. "The Seniority System." In We Propose: A Modern Congress, edited by Mary McInnis, pp. 23-33. New York: McGraw-Hill, 1966. Maysilles, Elizabeth. "A Critical Analysis of Persuasive Techniques Used by John V. Lindsay in Speeches on the Subject of Education 1966-1973." Ph.D. diss., New York University, 1980. Pilat, Oliver Ramsay. Lindsay's Campaign: A Behind-The-Scenes Diary. Boston: Beacon Press, 1968.